The Golden Nugget Wrasse, just arrived from EcoAquariums Papua New Guinea. On a hot Southern California summer afternoon in a Valley warehouse adjacent to Van Nuys airport, an important bit of North American aquarium history occurred. On Saturday, July 14th, the first North American shipment of sustainably collected marine aquarium animals from EcoAquariums Papua New Guinea (PNG), Ltd. arrived in the United States. This marks the first opportunity since North American aquarists rallied around the new PNG aquarium fishery in late summer 2010 that sustainably collected animals from PNG will be widely available to Americans. “This shipment is not only important to me personally,” Joe Caparatta told CORAL Magazine during an interview while the animals were being unpacked, “I feel that it’s important for the hobby.” Caparatta is the owner of Manhattan Aquariums and New York Aquarium Service. He founded the original Unique Corals in the basement of the New York store before moving it to Los Angeles, where he is rebranding it with the sustainability ethos. Joe Caparatta, checking the tags of incoming fish. Caparatta and partner Scott Fellman are set to launch the new Unique Corals, a boutique marine aquarium business dedicated to making “conscientious, sustainable and responsible” aquarium animals widely and readily available through both wholesale and retail sales. 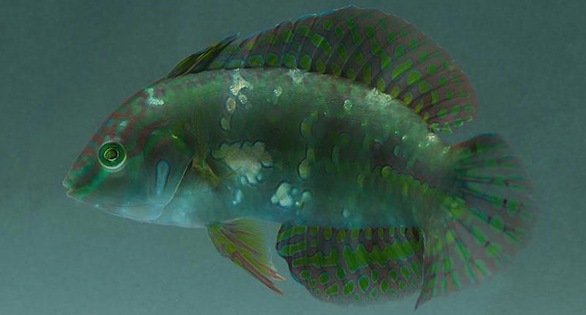 The official launch of the new company is scheduled for early August, and the recently imported PNG fishes (and a few zoanthids and other inverts) are front and center in the inaugural line-up of a uniquely different approach to the marine aquarium trade. Fellman, who most recently worked at Connecticut-based House of Fins, returned to his native Southern California to help launch Unique Corals with Caparatta. Johnny Ciotti, former creative director and photographer at Ecoxotic, is also involved in the new company, which, according to the mission statement, will only support “responsible collectors, aquaculture facilities, coral propagators, fish breeders, and marine scientists who believe that it is possible to have a thriving aquarium hobby/industry and, more important, a healthy marine environment, for future generations to enjoy.” Ciotti is working with Fellman on forging brand identity and creative strategy. Watching a Percula Clown being tanked. While it has had a bit of a rocky history, the PNG marine aquarium fishery remains synonymous with sustainability for many North American aquarists. In 2010, PNG became emblematic of what a growing number of North American aquarists believe is a necessary sea change in how the global marine aquarium trade operates. Based on the collaborative work undertaken by EcoEZ, a US-based environmental consultancy, and PNG National Fisheries Authority (NFA), PNG-based SEASMART emerged on the public stage during the summer of 2010. The PNG marine aquarium fishery promised to become one of only a handful of marine aquarium fisheries–and, notably, the only one in a developing island nation–sustainably managed based on scientific data. As CORAL Magazine covered in “A New Frontier for Marine Livestock Collection” (July/Aug 2010), SEASMART’s definition of sustainability went well beyond environmental sustainability. For SEASMART, sustainability also meant socio-economic sustainability for fishers and fisher communities, something many aquarists had never contemplated. There is palpable excitement as people get a glimpse of livestock from the new collection areas in Papua New Guinea. 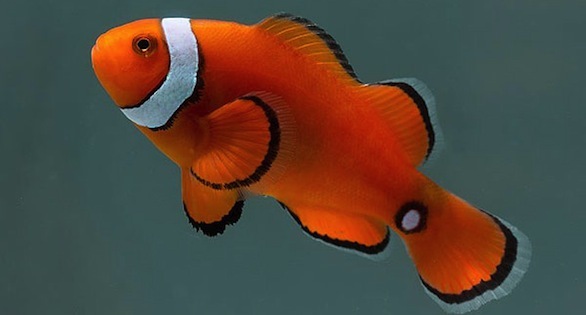 Through having access to PNG, aquarists will start seeing some stunning “new” animals like the so-called Gold Nugget Wrasse (Xenojulis margaritaceus) and a plethora of misbarred clownfishes best exemplified, of course, by the now famous Lightning Maroon Clownfish. 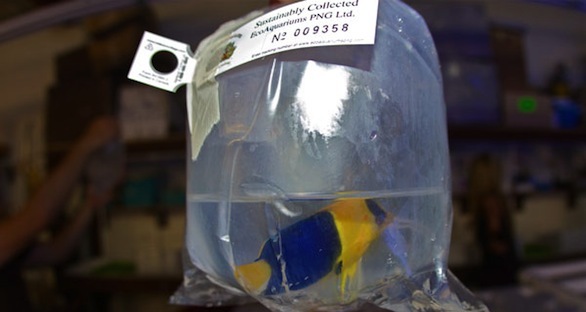 Incoming Bicolor Angelfish, Centropyge bicolor, arrives in Los Angeles from Papua New Guinea. Unfortunately, just as word was getting out to North American hobbyists about SEASMART in September 2010, the three-year trial period, during which SEASMART was heavily subsidized by NFA, was coming to an end. While SEASMART managers hoped to continue to operate collaboratively with NFA in PNG, fisheries managers decided to head in a different direction and privatize the fishery. As a result, for sustainably minded North American aquarists who were now eager to have access to PNG animals, there were no PNG animals available. Industry observers who had hoped PNG’s marine aquarium fishery could be a model and impetus for trade reform, watched anxiously, knowing that privatization of the fishery could go either way. In 2011, NFA announced they would award one export permit to one marine aquarium business, and early that summer, as reported in CORAL, EcoAquariums PNG was announced as the permit holder. Daniel Navin, an American who had been the mariculture director for SEASMART, is the founding director of EcoAquariums. While the company has already shipped to both Asia and the United Kingdom, this first shipment to the United States is particularly noteworthy for Navin. At present, the aquarium animals available to aquarists in North America represent the gamut in terms of sustainability and legality. Because it is so difficult for the aquarist at the point of sale to know the origin of the animal he or she purchases, the reality is that most North American aquarists who have purchased marine fishes, corals and other invertebrates from fisheries around the world have unwittingly supported unsustainable fisheries, destructive fishing practices and illegal activity. While there are some fisheries, such as those in the smaller developing island nations (e.g., Fiji, Solomon Islands, etc. ), where collection is generally sustainable and destructive fishing practices like cyanide use is rare, it often difficult or impossible for the aquarist to know they are purchasing an animal from one of these countries unless, of course, the animal is endemic. While various certification and labeling schemes (e.g., Marine Aquarium Council certification and Quality Marine’s tank tags) have attempted to address this issue, there is still a distinct lack of transparency in the North American marine aquarium trade. A Misbarred “Horned” Maroon Clown, part of the first shipment. Will People Put Their Money Where Their Mouth Is? The big question, as alluded to earlier by Navin, is how will these sustainably collected animals from PNG be received in the marketplace, and, more pointedly, will aquarists be willing to pay a price premium for them? Given the fishery management procedures, the higher-than-average wage paid to the fishers and the cost of freight from PNG, Unique Corals will need to pass along some of the additional cost with the tag. Fellman believes aquarists will be willing to pay a little more for these animals. After all, this is a model consumers in North America commonly see employed at the grocery store. Whether it be sustainable seafood, cage-free hen eggs, grass-fed beef, fair trade coffee, or any number of other products that are priced somewhat higher than their non-ecolabeled counterparts, consumers in the United States have proven there is enough market share for both “cheap” products and products that may be more consistent with an individual’s personal ethic. Dale Pritchard is owner and managing director of EcoreefUK Ltd., a wholesaler of marine ornamental fishes and corals in the UK, and he has been actively working to promote and sell EcoAquarium’s fishes in the United Kingdom for the past six months. “It has become clear to me that there is definitely a market for a sustainable option,” he says, “but the most difficult part has been convincing retailers to stock the fish.” Pritchard explains that, for many marine aquarium livestock retailers, it is all about economics. “Success for them is to be able to sell fish cheaper than their competitors down the road.” While Pritchard certainly understands the role of price in driving markets, he strongly believes price should not trump all else. Misbarred Maroon Clown, below, part of first shipment. “The truth in fact is the most successful retailers are the stores that offer something different with great service and advice,” he says. 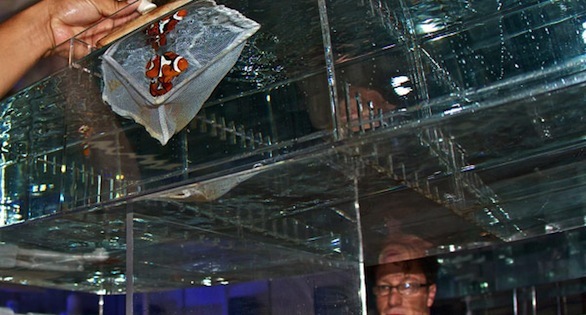 “The most successful retailers I have visited understand this and will not consider the price as being the primary driver in purchasing decisions.” Pritchard says, in his experience, these retailers tend to have a deeper understanding of the marine aquarium industry and the importance of having a unique selling point. Pritchard and Unique Corals’ Fellman and Caparatta are hedging their bets on the belief that there are enough customers–both wholesale and retail–who are willing to pay a price premium for a marine aquarium animal with just such a distinguishing selling point. “EcoAquariums makes it easier to show this at the point of sale through their labeling system, which really sets their animals apart,” says Pritchard. At present, the EcoAquariums’ label accompanying every animal exported is the closest thing aquarists have to a now widely available ecolabel. Misbarred PNG Percula Clownfish with caudal eyespot. “Besides being sustainably collected and equitably traded,” explains Navin, “all of our fish come with a serialized waterproof tag that allows each fish to tell a unique story.” Each tag has a specific number that, when entered into the EcoAquariums database, gives the aquarist an ever more complete picture of where the animal originated and its collection and transport to the local fish store. “The tags come into their own in helping to generate interest and an introduction for storekeepers to talk about the sustainable and ethical nature of EcoAquariums’ operation,” says Pritchard, who adds that aquarists in the UK have been willing to pay a price premium of up to 25 percent more for these animals from PNG. In an industry where devaluing the animals is one of the greatest threats to sustainability, these increased prices are widely thought to be a positive step for the trade. Unique Corals plans to launch its website in August, making these and other animals widely available to sustainably minded aquarists across the United States. Southern California aquarists will have an opportunity to view and purchase these animals prior to the official company launch at what Unique Corals is calling a “Sneak Pique” at their Van Nuys facility on Saturday, July 21st. In addition to the PNG animals from EcoAquariums PNG, there will be a variety of other cultured animals and animals sourced from sustainable collectors available at “exclusive pre-debut prices.” Unique Corals will also be holding a raffle at the event, with proceeds benefitting the Coral Restoration Foundation. …and that’s why Unique Corals has already discussed its next order with EcoAquariums. Finding Dory: A Darker Side? 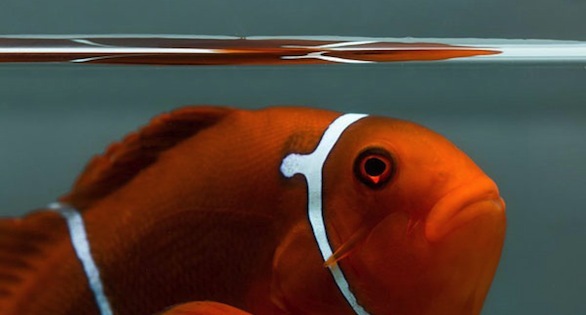 Can unusual suspects reform the aquarium livestock trade?